Buddhayana [佛乘] is an Indonesian Buddhist movement which respects the spirit of pluralism, inclusive, and non-sectarian. Inside the monasteries of Buddhayana, all mainstream Buddhists can live together in peace and flourish along with adapting to local cultures of Indonesia. 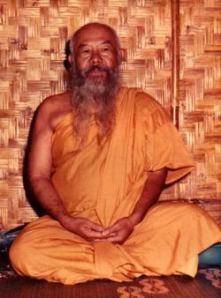 Late venerable Ashin Jinarakkhita after finishing his studies at the University of Gronigen Netherlands, he has taught at several schools in Jakarta. While he was active in Pemuda Teosofi and Gabungan Sam Kaw [三 教] Indonesia, and organized the first National Vesak celebration at Borobudur Temple in 1953. In the same year, coinciding with the celebration of enlightenment of Bodhisattva Avalokitesvara (Guan Yin, 观音 菩萨), The Boan An ordained by the late Venerable Ben Qing [本 清 老 和尚] as a novice with new name Ti Zheng [体 正]. Then he learned vipassana meditation in Burma (Myanmar) under the guidance of Sayadaw Mahasi and was ordained as a monk by him, and given the name Jinarakkhita [体 正 老 和尚]. He is the first Indonesian who accept the ordination of monks since the ruin of the kingdom of Sriwijaya and Majapahit. Upon his return to homeland, he actively teaches meditation and gives lectures to various rural areas across Indonesia. He encouraged the establishment of monasteries and Buddhist associations of the city to the villages. Over this is incredible effort, Buddhism began to rise again. In the year 1955, he establishe Lay Buddhist Oranization called Persaudaraan Upasaka-Upasika Indonesia (PUUI) as a forum for Indonesian Buddhists, who assists the monastic sangha. Along in its history, PUUI changed their name several times, and now uses the name Majelis Buddhayana Indonesia (MBI).